Paradiso, the low-key Italian cafe run by Alessandra Veronese and her husband Jose at 105 Avenue B, has closed. A sign greeting patrons here near Seventh Street notes that they are "moving on! To wherever the future is taking us!" Not sure at the moment why the cafe closed. They opened here in January 2009. There's a new listing for the space, which has a $4,200 monthly asking rent. Veronese previously operated La Casalinga (1991-2008) at 120 First Ave. near Seventh Street. Two in a row on that corner. Hopefully both spaces get rented quickly so B doesn't start turning into a ghost town! Loved this place. Food was excellent, reasonably priced and relaxing atmosphere. All the best to Alessandra and Jose for their next venture. I hope they are not moving far and wish them all the luck. What a bummer, this is on my Maguey Y La Tuna, Ciao for Now, Cafe Orlin, Northern Spy, Ost, Barbone, Angelica spectrum of hurt, amazing places this neighborhood once boasted. Tragic, but I suppose someone can rebut this with its all happened before and before that too. Sigh. 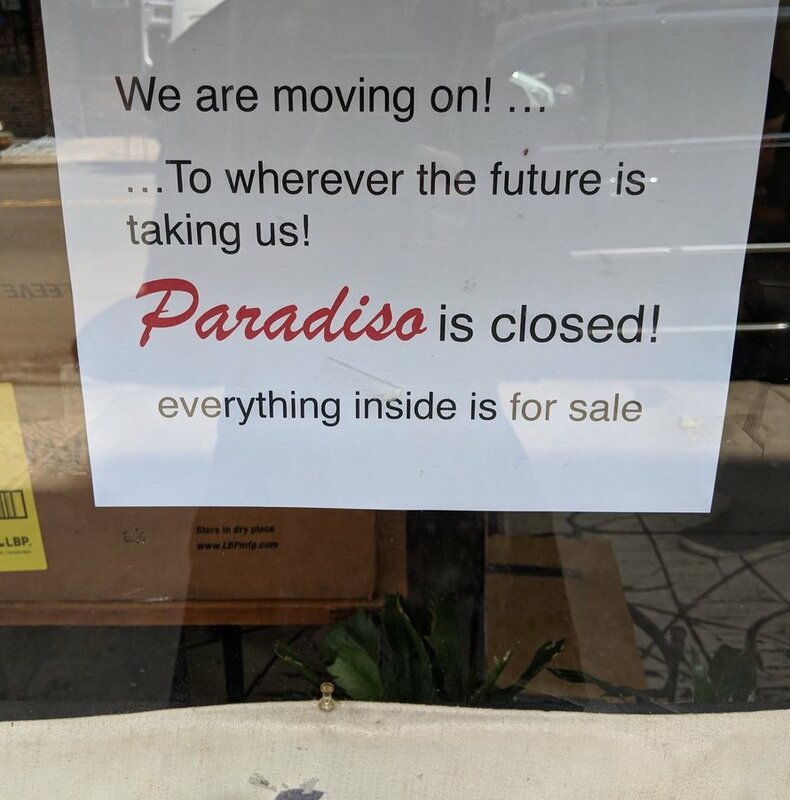 Paradiso was one of my favorite restaurants - a place with fantastic food where people could relax and have a conversation without being drowned out by loud music and patrons. Thank you to Alessandra and Jose who always treated us like family - you will be greatly missed. $4200 a month for that sliver of a space—and knowing it's a typical rent for the size—is a good reason why all these spaces are empty. I loved their eggs and salads, and Alessandra and Jose were always so friendly. We have fewer and fewer neighborhood places to eat. Alessandra and Jose, I will so miss Paradiso. Thank you for all the cozy lunches. Paradiso was by far my favorite neighborhood spot.